I just took the plunge on purchasing my one-way plane ticket back to cornbread land. The home-stretch is here. 2,292 miles down and (ONLY) 366 miles to go. I distinctly remember when it was 366 miles down and 2,292 to go. But for now, let’s live in the present (my guru tells me I need to work on this). I’m in Packwood, Washington soaking up the town’s biggest weekend of the year by enjoying a carnival corn dog and a fresh-squeezed (self-spiked) lemonade. The “Packwood Labor Day Festival” seems to basically be a city-wide yard/junk sale? Big things happening in “middle of nowhere” Washington y’all. However, I’ve been informed that there is karaoke at the Blue Spruce Saloon this evening so the festival’s main event (my riveting future performance of “Africa” by Toto) is yet to be witnessed. Answer: The only thing they share in common is walking through the wilderness with a backpack (and excessive amounts of honey buns). AT: It frequently rains and is extremely humid. We’re talking “Is this chaffing or a nether-region disease” type of humidity. PCT: I’ve seen rain twice in 5 months and there is 0% humidity (only a slight exaggeration for the sake of the story). AT: Hardly any sun exposure at all (a vampire could possibly survive’ish). Non-stop shade and no sun screen needed. PCT: If I had to guesstimate, 80% of the PCT is totally exposed with no shade. We crammed 7 people under a bush one day for a break (one of those low points that is memorable enough to make it a high point). I’ll probably go through a gallon of sun screen out here. AT: You carry an average of 40 miles worth of food. PCT: You carry an average of 80 miles worth of food (WAY too much time between burgers and beer if you ask me) due to being in far more remote wilderness. AT: The AT is steeper, muddier, rockier, and rootier (which is definitely a word so don’t bother looking it up). PCT: The PCT is designed for horse travel as well as backpacking. Therefore, it is more gradual and manicured. AT: There are shelters every 10 or so miles. Campfires occur nearly every night. Cowboy camping is extremely rare because it can rain at any time. PCT: There are no shelters. Campfires are banned 90% of the time due to wildfire risk. I cowboy camp every night (I could have just said something like “the opposite of all that”). AT: Average of 14 miles per day with an 8 month weather window to complete the trail. 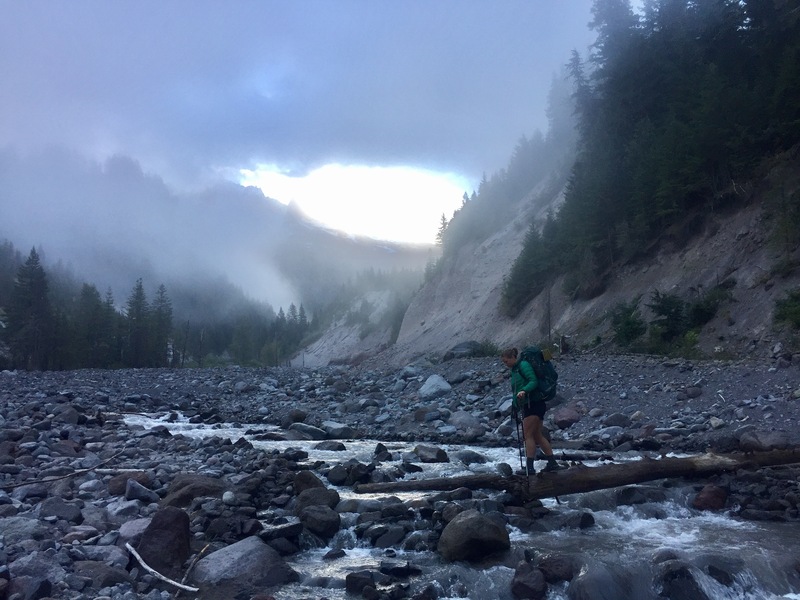 PCT: Average of 20 miles per day with a 5 month window to complete the trail. This only ends up being a wash between the two because of the different terrains. AT: We call the AT the “green tunnel.” This is defined by Webster as the following: don’t expect any wide open views due to consistently being in densely forested areas. PCT: Constant 360 degree, glorious, expansive views. Everyday something visually stunning is seen. AT: There is so much water that rock-hopping over creeks becomes frustrating. Wet feet are NOT happy feet. On average, you will only need to carry around 1 liter (2 pounds) of water at a time. PCT: Water can be a scarce commodity at times (nearly elusive as the in-town burger beer combo). Our longest stretch to date without water is 35 miles. The biggest issue with this is the extra weight of water. It is one of the heaviest items in your bag. The most water I have carried at a given time is 6 liters (12 glorious pounds of annoying weight). – We have developed a brand new set of highly effective hitchhiking techniques to get into town. It’s nearly impossible to put the refined intricacies of this beautiful display into words, but it basically resembles roadside homeless birds ice skating. – Boo Boo makes the executive decision to stop wearing sunscreen on his arms and has opted to wear men’s formal socks as sleeves instead. This future, cutting-edge fashion trend features 5 individual holes cut out of the toe area for finger access. Style. – One night, we crawl into a crowded campsite well after dark, exhausted after a long day. We have no other options, so we have to stay despite the lack of space. There is definitely no room to set up a tent so we have to cowboy camp (sleep on the ground). After laying down, I count 25 spiders, 3 frogs, and a few other assorted creepy crawlers on me. I resolve this problem by wearing my tent (yes, wearing my tent) like I’m in a rolled-up zip lock bag. It didn’t bother me too terribly, however I feel that it could have been a claustrophobic’s worst nightmare. – We are in town taking a day off and stop by a bar for a drink. I order a cocktail and the bartender informs us “Sorry, no ice. The city just issued a water ban because they found E. Coli in the city water.” Coincidentally, each of us has just chugged a significant amount of water minutes before that upon arriving in town… Perfect. – Manzanita (the cat) has become quite the guard kitty and center of attention. One night, we are camping by a lake that is notorious for its mice population. As I’m sleeping, I awake to hear a ruckus brewing. I peer out of my sleeping bag and turn my light on just in time to catch Manzanita in the act of stalking a mouse that is beginning to bite into a food bag. That story doesn’t end well for the mouse… She then proceeds to guard everyone’s food bags for the entirety of the night only pausing once for a 30 minute break to snuggle up in my sleeping bag with me. – This is only the beginning of Manzanita’s killing streak… We catch her in the middle of hunting a bird and we capture a video of the action. The video makes its way to the “PCT 2017” Facebook page. Lots of the responses are something to the effect of “Nice job Manzanita! I remember when she was the size of my palm and now she is getting so big and strong!” However, plenty of comments go in a far darker direction: “I’m calling the local authorities on your cat” and “Eye for an eye: the cat should be killed for this.” The post goes viral in the community and incites over 700 comments. What do we do? What ANY good thru-hiker cat family does best: create fake Facebook accounts and troll the haters. That’s all for now folks. That one way ticket I mentioned is set for a return on Monday Sept. 25. The mixed emotions haven’t quite set in yet but I’m sure that will intensify as the flight date and Canadian border grow closer. I’ll be writing my final blog from home so no shortage of those sappy, sad feelings will dominate what is sure to be a riveting final installment (I’m sure you can hardly contain your excitement now). However, it will also most likely include a detailed account of our taking the Seattle karaoke scene by storm. See y’all soon. Please come visit me in auburn. I always have a couch for you to sleep on. There are several great games this year! I am glad that you have a cat protecting you out in the wild! Take care of yourself and enjoy the last growling miles! Stay safe!